With more people being arrested or called in to record police statements, it is clear that the government is determined to use the state machinery to further restrict freedom of speech and expression against Ugandans who are expressing dissenting views against the plot to give way to Yoweri Museveni’s ‘life presidency’ project. A week since President Museveni and his Cabinet endorsed the move by Members of Parliament from the ruling party to amend article 102(2) of the Constitution and lift the age limit on contesting the presidency, the Police have arrested or quizzed a number of individuals including politicians for talking against the project. The crack-down has gone as far as violating existing laws that give Members of Parliament the privilege to speak on any subject without fear of falling foul to prejudice. Yesterday, the Police summoned four MPs critical of the largely unpopular move to amend the constitution. The MPs: (Theodore Ssekikubo, Muhammad Nsereko, Barnabas Tinkasimire, and Allan Ssewanyana) spent several hours at Police CID in Nagguru where they were queried over alleged ‘offensive communication and incitement’ remarks. This came after the MPs vowed to oppose the plan. The MPs labelled the police’s summons not just as a sign of the force’s display of political bias, but also as a confirmation that the government is prepared to use force to push through the amendment. The police also arrested a group of seven youth who were carried placards in Kampala denouncing MPs for plotting to lift the age-limit. Last week, the State Minister for Investment Evelyn Anite shocked the nation when she said that no body would frustrate the plan to amend the constitution since it has the backing of the army. Despite her apparent treasonous statement, police has not called her to explain. The ‘rebel’ MPs questioning came after the police arrested people who were protested the lifting of the age-limit in Kampala and For-portal under the ‘K’ogikwatako’ and ‘the 75 is the Limit’ campaign. 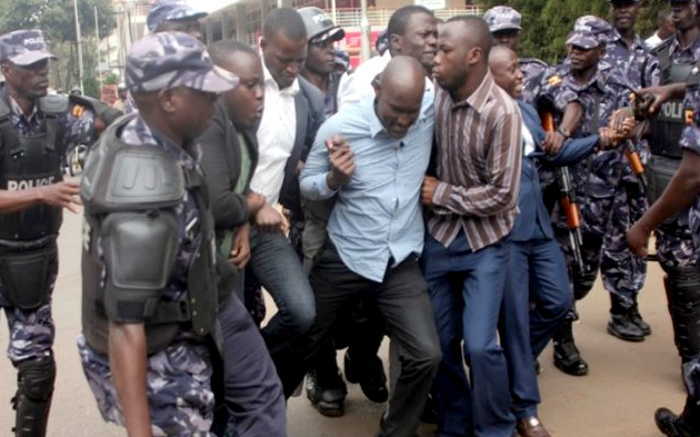 A week ago, Police arrested Democratic Party’s Vice President Mukasa Mbidde in For-portal while he was speaking to the media about the planned amendment. The ongoing suppression of fundamental freedoms is contrary to Article 29 of the Constitution that guarantees Freedom of Conscience, Expression, Movement, Religion, Assembly and Association. Even with those guarantees, recent laws such as the Public Order Management Act, the Computer misuse act, have had a chilling effect on the public that anger against the plot is only boiling underneath as majority fear the full force of the security agencies. 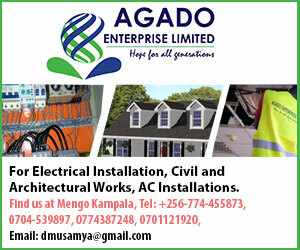 The tension is expected to only rise as the ruling party prepares to table their request before the house to allow Igara County West MP Rafael Magyezi to seek leave of absence to prepare for a Private Members Bill to amend the Constitution. But Kampala Central MP Muhammad Nsereko promised a fight against Magyezi’s plan saying that there’s a Parliamentary precedent on this matter where Speaker Kadaga ruled against any further bills on constitution amendments arising from individual MPs. Despite the disappearing space for freedom of expression, more people are using mass media platforms to out their views. On Monday, the Inter-Religious Council of Uganda (IRCU) issued a statement in which they opposed the planned removal of the age-limit provision. They instead called for a referendum saying that such an important provision needs the backing of the people. In a statement that was read by their chairman Mufti Ramathan Mubajje, the clergy called for the re-instatement of two term limit provision that was removed in 2005 and the holding of a referendum on the removal of the age limit. What next after passing of the biosafety law?